Sgt. 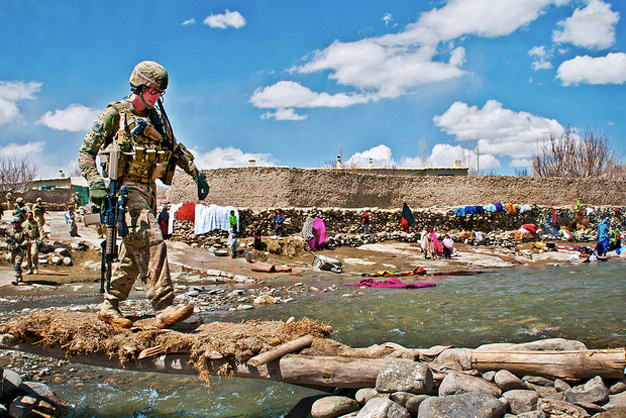 Michael Trevino, personal security detail, non-comissioned officer, 172nd Infantry Brigade, utilizes a foot bridge to cross a swollen river outside of the village of Marzak while locals wash clothing on the far bank. Marzak has historically been a stronghold for the insurgency over the past decade until the Afghan and US forces took advantage of the winter months to establish a local police force at the request of the elders and secure the village from foreign fighters who transit the area during the fighting season. Photo by the US Army.